Around and around and around . . . . So quilting is underway on my Maybe Quilt! I got out my “Divide and Conquer” book to refresh my memory on how to do Quilt As You Go. The book discusses several ways to do it, but I’m using Method 1 here; basically, you quilt each section, leaving an unquilted border on the edges you’ll need to join later, then sew the tops together, trim the batting to fit, and hand sew the backing. So I figured out which edges will need to be joined and ran a line of hand basting about 2″ from those edges. You can see a bit of the basting at the center bottom of the picture above. Note: if you do this, be smart and don’t make my bonehead mistake–your basting should only be through the top of your quilt! On the first panel of the quilt, I started in the middle and did one big spiral–easy and fun! As you can see in the picture above, I just eyeballed it; I tried to keep the left edge about a presser foot’s distance away from the last line of stitching, but I didn’t obsess over it. I LOVE quilting you don’t have to mark. You’d be surprised at how neat and even it looks, though it really isn’t! As you can see here, the effect is pretty subtle, which is fine, since there’s already a lot that’s happening in this quilt. 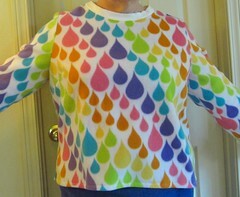 The rainbow fabric shows off the quilting, but it’s nearly invisible on much of the quilt. I’m not sure how I’m going to go about fixing this–maybe rip out most or all of one spiral so that I have somewhere to push that excess fabric? Rip out part of each and hope to ease that excess in? I’ve put this in the naughty corner for the moment so that I can ponder what to do and grumble about the unfairness of life. One thing’s for sure–on the other two sections, I am DEFINITELY doing a spiral close to the middle, then working out from there. Harrumph. Blanket stitch gives a nice finished look, but it takes so long on all these letters! Tried to use Lazy Daisy to suggest drops of liquid here. I did a backstitch in a sort of zig zag pattern on these letters, which I really liked. I’m hoping to get these packed up and in the mail next week. Then I need to get going on a little something for my sister’s birthday next month. So many things to make! Note to self–less time reading up on the John Grisham (or maybe Mario Puzo?) novel that U.S. politics is currently inhabiting means more time for making things! Have a very excellent week and I hope you’re able to set aside the craziness and focus on making lovely things (at least until it’s time for the next march). Take care. YOU MAY TAKE MY PHOTOGRAPH NOW, HUMAN. My baker’s rack and a couple of binder clips: essential photographic gear. If you recall, this quilt top is now in four pieces for quilt-as-you-go purposes. In preparation for quilting it, I set about making a scrappy backing from the leftover fabric from the top. I started the process by googling–there must be a tutorial someplace on how to do this, right? Well, there may be, but I didn’t find it. Lots of quilters do things like inserting a finished quilt block into a plain quilt back, but I didn’t really find anything on making a totally scrappy back. So I spent about three days–and nights, as I tend to dream about problems I’m working on–thinking about how to turn a pile of scraps into a quilt back. My goal was to use up as much of that fabric as possible without using a quilt pattern or spending a huge amount of time on it. The method I came up with was to cut my pieces into squares and rectangles as efficiently as possible. All the resulting strings were sorted into piles by length and each pile was sewn together, then trimmed. That gave me larger string blocks to work with; I laid out the section of quilt top, then moved around my string blocks and larger pieces of fabric until it was completely covered. Then I sewed the whole mess together. This was the perfect opportunity to use that Sylvester and Tweety fabric! I got it in a huge Freecycle box of fabric several years ago and have been saving it for just the right project; I only had that one strip and the design is huge, so it wasn’t the easiest scrap to use. So, verdict? This was really fun to do and I love how the backs turned out! And LOTS of scraps found a home–almost all the fabrics you see here were completely (or almost completely) used up! I only made two of the four backing sections I’ll need for this quilt, and I’m actually a little concerned that the blocks I have left won’t be enough to make the other two, so I picked up another fat quarter today while I was out with my mother. I hope all is well with you and all your projects are well-behaved and free of drama. Unless that’s what you’re into. I don’t judge. New park last weekend–this is W.E. Johnson Park in Richland, WA. I FINALLY finished my PJs yesterday, after what felt like about six months of working on them. I’ll try to get some better pictures sometime, but these were what I was able to snap quickly between appointments #2 and #3 today. Cats are always so helpful. The Simplicity on the left is the pattern I used for my last pair of PJs. They were perfectly wearable–and I literally wore them to pieces–but I wanted to see if I could get a little better fit on my next pair of PJ pants using a pattern designed for women. So I hunted down the See & Sew pattern, the only one I could find that was just for women, meant for woven fabrics, and not a traditional buttons-up-the-front style (I don’t know why, but I just have an aversion to that style). So I used the S&S pattern, a simple, quick pattern, but basically complicated it as much as possible. 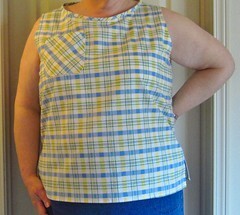 The top was too short, so I added a band on the bottom, attached with flat fell seams. The full-length pants were super long, so I made the capris and added another band on the bottom–more flat fell seams–and I mistakenly put the band on the TOP of one of my pieces rather than the bottom, so that had to be fixed. 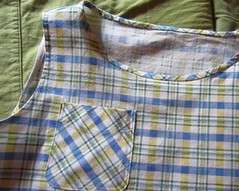 I used the pocket piece from the Simplicity pattern to add a pocket to the right pants leg. Which was great, except that I then discovered that my pants legs were too roomy, after I’d done flat fell seams on the sides (with a pocket on top). So I took in and tapered the pants as much as I could using the inner leg seam. I would like to take them in more, but at this point I’m frankly in no mood to be ripping out any more flat fell seams. So, bottom line: I LOVE the fit on my new PJs, except for the pant legs, which are too big and drafty. If I get to the point where my annoyance at the drafts outweighs my innate laziness and dislike of mending, I’ll tinker with them again. We’ll see. For now, though, I (mostly) love them. But wait, you say, surely these can’t be a need for our friend STH? Hasn’t she whined (pretty much endlessly) about the indignities of geezerhood, such as her creaky old joints and her not being able to see to embroider? Well, my friends, all I have to say to that is that Mother Nature is obviously the one in charge here, not me. I looked at some tutorials and would up using this one. My version has flannel on top, two layers of thin batting in the middle, and fleece on the bottom. I intentionally made the first couple of pads thin, to see if I could get away with using so little padding. And so far, so good! Very quick and easy to make, and very effective so far. I’m using regular sew-on metal snaps on these; they’re a bit time-consuming, but no way am I buying a Kam Snap set for these pads that I don’t expect to use for much longer (I can only hope Mother Nature agrees). The only real quibble I have is the claim in the tutorial that the cotton tops won’t stain; not my experience so far, but, again, my hope is to not have to use these much longer. Quite grumpy to still be using them at all, but I do admit to being pleased to be able to use up some batting and fabric scraps to make them. One more picture from the park, then I’m heading for bed. Have a wonderful weekend, and I hope all your projects are coming together nicely.